The Coalition is proud to announce this year’s J. Robert Maguire Lecture. Willard Sterne Randall will be delivering the presentation Benedict Arnold: Fact and Fiction. Willard Sterne Randall, New York Times best-selling biographer and historian, cut his teeth on his father’s copy of Kenneth Roberts’ Rabble in Arms and several other of the Maine-born journalist-turned-novelist’s classic studies of the Revolutionary War era. Like Roberts, Randall left behind a career as a successful investigative journalist to unearth the facts about the most controversial figure in the Founding Era. Roberts broke new ground as an historical novelist; Randall chose the path of historical nonfiction as he explored many of the same events, characters and terrain to produce Benedict Arnold, Patriot and Traitor, a 1990 Notable Book of the New York Times. And both became fascinated by Arnold’s exploits on Lake Champlain. How do their accounts compare and contrast? 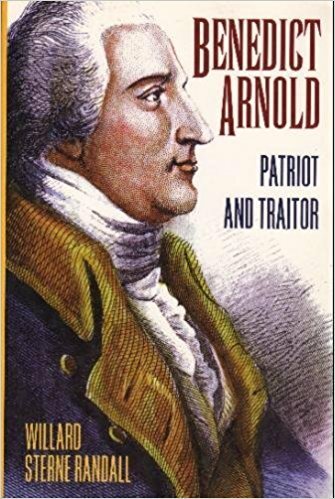 We suggest that you reading Benedict Arnold, Patriot and Traitor prior to the talk — though it is not necessary. The J. Robert Maguire Lecture Series has been established by the Mount Independence Coalition to honor Shoreham resident Bob Maguire, who was one of the leading opponents of a nuclear power plant that was proposed to be build near by the Mount in the early 1970s. Bob is also an avid historian himself, and has been very generous in allowing other historians access to his extensive library of primary materials. The lecture begins at 2:00 p.m. at the Mount Independence Visitor Center Auditorium. Admission to the public is free of charge. This talk is part of the Orwell Free Library community book discussion of Rabble In Arms. If you’ve read Rabble, be at the Mount by 12:30 for a discussion of that novel.